I have been asked ,, why I don't put these on ebay. I have put things on ebay before, with mixed results. I would rather have someone be able to look at what I have, be able to judge for themselves if they want them or not. Shipping is a problem also. I live out in the sticks, and would have to travel some to get to a post office. Soooo, just thought I would try here first..... And yes. 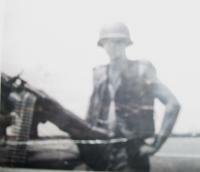 Thats me 50 years ago in Viet Nam.